French alabaster pendant light or chandelier with brass fittings suspended on newer rayon covered cord hangers and alabaster ceiling cap. The white alabaster has abundance of beautiful grey veining with beaded carved detailing on bowl. Fixture uses 1-60 watt regular a base bulb, newly wired. 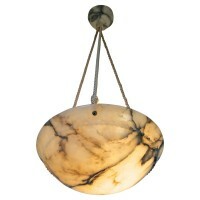 Diameter of alabaster is 15.75″, overall height including rayon cord and ceiling cap is 38″ (height can be shorten to suit).